As I mentioned earlier this week, J and I snuck off on a lovely little vacation last week! Over the past 6 years that we’ve been married, (and the years prior to that) we’ve gone on a ton of fun trips with family. They’ve all been so amazing, but we realized that we haven’t been on a trip that’s just for the two of us since our (incredible) honeymoon in 2009. This was long overdue, especially knowing that we have another baby coming in March! So we began looking. We knew we wanted to keep it at a week, as this was our first time really being away from A for more than a night or two. We also had a limited budget. After much research, we decided to have a day in Miami Beach followed by a four day Bahamas Cruise on the Norwegian Sky. We left on a Saturday in the middle of the day. We flew with Delta and had two very comfortable flights. Each staff member that we met could not have been friendlier to us! We did not have seat assignments for our first flight to LaGuardia. When we went to the desk at the gate, they were offering $300 vouchers to anyone willing to bump to the next flight. If we didn’t have such a short connection, we would have happily taken that opportunity, but it just didn’t make sense for this trip. The gentleman at the gate quickly got us some seat assignments and we were happy to see that we were in the front most seats in coach (just behind first class) which had an insane amount of legroom. I mean, seriously. I could have laid down and taken a nap with almost enough space to starfish. It was fantastic. It was a smooth flight into LGA, they took a route in that I’m not used to. They actually flew right past the city and we got to see some excellent views of the skyline! Pretty nice sight for this ex-New Yorker and super fun commentary from one of our flight attendants. Our flight to Fort Lauderdale was pretty easy as well. Though not quite as much room to spread out, it was still reasonably comfortable and uneventful ( was super impressed with the very well behaved toddler in front of us and behind us). Once we got in, we were surprised to be greeted by a HUGE party in the terminal. People had gathered to welcome back World War II veterans who had been in Washington DC for the Freedom Flight. The atmosphere was one of pure joy- loud music, cheering, signage, bag pipes, tons of red, white and blue. Every American hero deserves this kind of welcome, it was beautiful! We had booked a Go Shuttle to our hotel in Miami Beach. It took a little while as they were dropping off other people on the way, but it was a comfy ride. We pulled into our hotel, The National Hotel a little after 9pm and were promptly greeted by the bellhop. Check in was super simple and we were happy to find our room while small was clean and very comfortable. We were pretty hungry at that point so we changed and immediately headed out to find some food. One of the reasons I chose the hotel I did is because of it’s close vicinity to the Lincoln Road Mall. Here we were able to find a ton of excellent dining options and stores within a block’s walking distance from our hotel along with a Walgreens and CVS pretty close by as well. We walked through the mall and I couldn’t get over how many people were out with their young children! A would never have gone for that (as she happily goes down by 8am each night). Totally different lifestyle, but it seems to work for them. We walked a few blocks until we found the Shake Shack. Now I know what you’re thinking. Two people who lived in New York City for a number of years came all the way to Miami to end up at the Shake Shack? I know, we’re to worst! But burgers just sounded delicious at that moment, and we’d always wanted to give Shake Shack a try! You can bet we were glad we ended up there! The burgers were excellent- I’d say they’re comparable to In-and-Out, though I’d give In-and-Out a slight edge as I like their beef a bit better and of course you can’t beat the spread. Still, our Shake Shack burgers were excellent and I thought the fries were perfectly crispy! I can’t even tell you how happy we were to see this tray of food. Hanger is a real this! Once we were well fed, we made our way back to The National and headed out back to check out the pool area. They have the longest pool in Miami and it was pretty impressive. It was actually open 24 hours but were starting to get really tired. The lounge area was quite loud as their bartenders and servers put on a cabaret each night (excellent voices, but mixed a bit too loudly for my taste). We headed up and went to sleep. As I mentioned our room was very comfortable. My only complaint is that we didn’t sleep too soundly because we were facing Collins Avenue, which was a bit loud. It woke us up in the middle of the night a few times. But there were so many things we loved about this hotel, that this small detail didn’t bother us too much. Quick Tip: if you are worried about the noise keeping you up at night, spend a bit more and book a poolside room. The next morning, we woke early to find it was warm and a bit windy. But the sun was beginning to peek out which we were happy about that considering that the weather reports for the entire trip were showing nothing but rain. We got dressed for the day (gotta love dressing for a day that involves bathing suits!) and headed down to find some food. 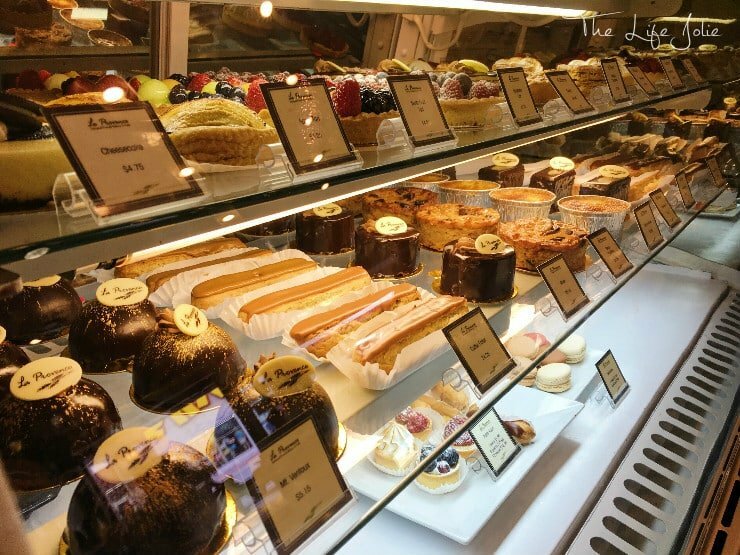 A block from our hotel was a fantastic little French Bakery called La Provence. They had a huge variety of sandwiches, desserts, pastries, bread, breakfast entrees and coffee drinks. We weren’t looking for anything too heavy, so we opted for a Chocolate Chip Croissant and a Raspberry Beignet. Both were delicious, but the Chocolate Chip Croissant was the true star of the show. The pastry had the most incredible chewiness with an amazingly flaky, buttery interior. It went beautifully with my Decaf Hazelnut Iced Latte. The fruit left something to be desired, but we thought the it was all pretty good value and we were satisfied. After that we walked the beach a bit. It was warm but still pretty windy and the beach in general was a little dirty. Still, I was happy to have my feet in the ocean! We then headed back to The National. It was much less windy in their pool area as it was protected by a fence. I enjoyed a few minutes on a hammock under some palm trees but we opted pretty quickly to get some lounge chairs in a prime location next to the pool. They had a gal working who’s sole job was to get you set up in your lounge chairs with the most fluffy, wonderful towels. The poolside server Miguel was super friendly and funny. He was attentive without being annoying and made sure we had everything we needed. J started with a Bloody Mary (I made him give me his olives and from what I could taste, it was amazing!) and then he moved onto a Margarita. I was super jealous because they used all fresh ingredients and Tequila and I are great friends. Maybe next trip when I’m not so pregnant! It was such a beautiful day, with just enough breeze to take the edge off of the heat and just enough clouds that the sun wasn’t beating down on us all day either. We snacked on some chips with salsa and guacamole for me and some chicken fingers for J (as usual). The food was just fine for pool side fair. We also chatted with a friendly couple that was enjoying their last day on vacation from Northern California. It was a really nice, upscale atmosphere without being snooty. We never felt uncomfortable and enjoyed an awesome day. In general every person that we came in contact with from The National went above and beyond to be gracious and friendly. We would absolutely return in the future. Around two or three in the afternoon it began to get a bit more overcast and we decided to go in and shower. Once we were ready, we wandered over to the Lincoln Road Mall in search of food. We ended up opting to check out Maya Tapas and Grill because of their cheap happy hour prices (a cheap daiquiri for J and cheap tapas for me!). He opted for a chicken and beef skewers with fries, while I enjoyed the marinated olives and a platter with manchego wrapped prosciutto, pitas and grapes. Everything tasted great to me and was the right amount of food for us at the time. After that we shopped around the mall area a bit before heading back to The National to take advantage of their half priced drinks for happy hour (be aware that the resort prices on food and beverage were quite high there, which we expected at any Miami resort). Quick Tip: Take advantage of the 1/2 priced food and beverages at the pool at the National between 5-8pm. J got another daiquiri and I enjoyed a virgin daiquiri. After that we relaxed for a bit in our room watching the football games before heading over to the Yard House to watch the late game. It was super dark so I didn’t even bother photographing the food but we split a salad and I had Calamari which was ok and he had Chicken Fingers (again). After that we picked up some bottled waters and bottles of soda to bring aboard the ship and headed back to our hotel to pack up and go to sleep before heading off on our cruise the next day! This post is already super long so I’ll be splitting this among a few posts 🙂 I’ll have another installment up in a few days. October 28, 2015 at 10:51 am We were totally fans as well- we can't wait to take another! October 28, 2015 at 4:51 pm Seriously, get there! It was so amazing! I'm dying to go back and check out some of the out islands like the Exumas and Long Island. October 28, 2015 at 2:56 pm Omg whyyyyy now I am craving a burger and fries so so bad and I have a nice healthy dinner all prepared at home. I HATE olives. Can we still be friends? October 28, 2015 at 4:50 pm I've been living on red meat lately- I can't get enough (it's terrible for our budget!). We can totally still be friends because that means I get ALL of your olives!